Well, it has been quite a fight between the latest entrants into the motherboard arena. While no clear winner could be decided by knockout, I think that it is fair to say the Asus P5Q Deluxe is quite capable to punch above its weight. Lacking the extra bandwidth of the MSI didn't seem to affect the scoring too badly and the motherboard still showed there is still plenty of life left in DDR2. 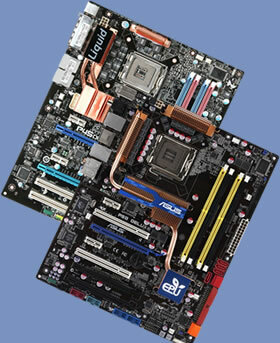 The MSI, while a very capable board, was both disapointing and frustrating in the overclocking stakes. It was not so much the end result, but the effort it took to get there. While the Asus board was pretty much point and squirt yielding superior overclocks with minimal fuss, the MSI took much more effort to get any satisfactory results. Coupled with the awkward BIOS, poor overclocking recovery and silly jumpers, I feel this board is best left to those who either have the patience of a saint or the sado-masochists. I feel board has alot of potential, and in the right hands with a better laid out BIOS, could yield some fantastic results. Also, it is of little use planting fancy waterblocks (which are not of the best design either) to cool what is obviously an overclocker's chipset if the board simply refuses to budge high enough to warrant a watercooled solution. Out of the two boards, the Asus performed better. However, it lets itself down with regards to accessories, an area in which the MSI shines. The included X-FI riser card was a great addition and good enough to put any onboard sound to shame. The MSI board had that feeling of luxury to it (despite its horrid colour scheme) whereas the Asus was shiny on the outside but dull on the inside. The copper heatpipe assembly on both boards could have been better thought out with better materials used. I do wish all manufacturers would refrain from sticking emblems onto the heatsinks themselves as it may look pretty but will no doubt have a detrimental effect on the cooling properties. The MSI's many on-board LED's, while again looked pretty, were at times confusing and the poorly written motherboard manual did little to help matters. Still, it is better than not having any indication of failure at all (ASUS). Regardless of the above statements, both boards, depending on your needs and demeanour, will no doubt serve you well, with the P45 chipset making them a force to be reckoned with. But for me, the Asus just snatches victory with the skin of its silicon. The simplicity with which it overclocks without any fuss (it either boots or it doesn't and then recovers if it doesn't) makes for an easy ride when attempting to push your hardware without having to absorb all the headaches that go with it. Considering the Asus board is not top of the line, I cannot wait to see what is in store for the near future. For now, though, the Asus Backstreet brawler has pipped the pretty boy from MSI in the first round of what I'm sure will be some knockout summer motherboard releases. Thanks to Asus and MSI for making this review possible. Discuss in our forums.